Tonight's review is something a bit different - half my review, half guest review. 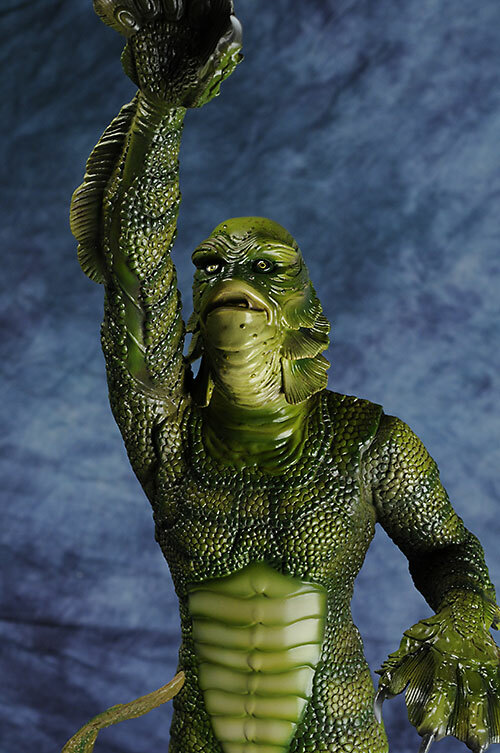 Long time reader Steve Horwitz wrote up a terrific review of the new Sideshow Premium Format Creature from the Black Lagoon, and asked if I'd shoot it. Because this monster is one of my all time favorites, I couldn't just shoot - I had to do some talking too. I'll keep it to a minimum though, and allow Steve to do most of the 'splainin. Get it started for us, Steve! Steve: Ironically I was born in 1954, the same year that David Carlson, Julie Adams, and Richard Denning stared in the classic film Creature from the Black Lagoon. Ten years later I saw this movie on a local Chicago television show called Shock Theatre. The Creature film must have had a major impact on my psyche because to this day I can’t get the Gillman’s persona out of my mind. That was almost forty four years ago. I venture to guess there are many baby boomers that feel the same way. In those days our family vacations consisted of trips to Florida that included quite a bit of beach swimming. As an eleven year old child It took a long time before I got over the fear of going into the water. I was convinced my fears of being attacked by the creature whenever I went swimming were real. In retrospect, the fear of being eaten by water creatures such as sharks hasn’t changed much. Consider the movie JAWS, that has surpassed an impressionable child’s fear of swimming to that of adults fearing shark attacks. 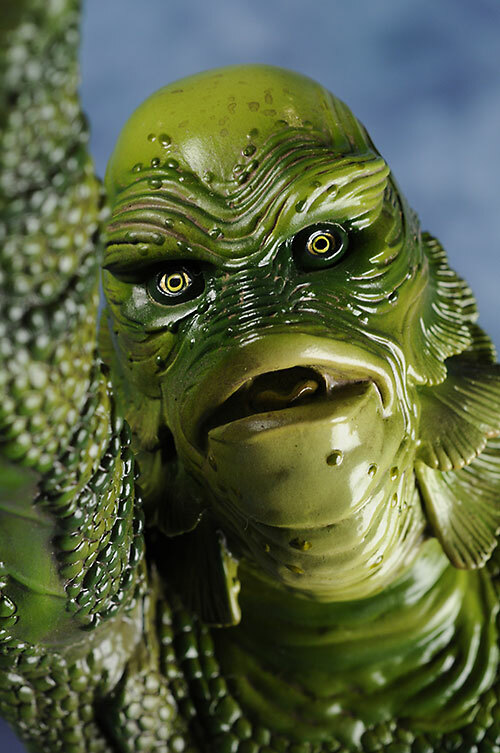 The plot is simple; however, Sideshow’s design of the Gill-Man, in my opinion, was not so simple to create. What I am about to say is done so with a great deal of admiration and passion for Sideshow Collectibles. 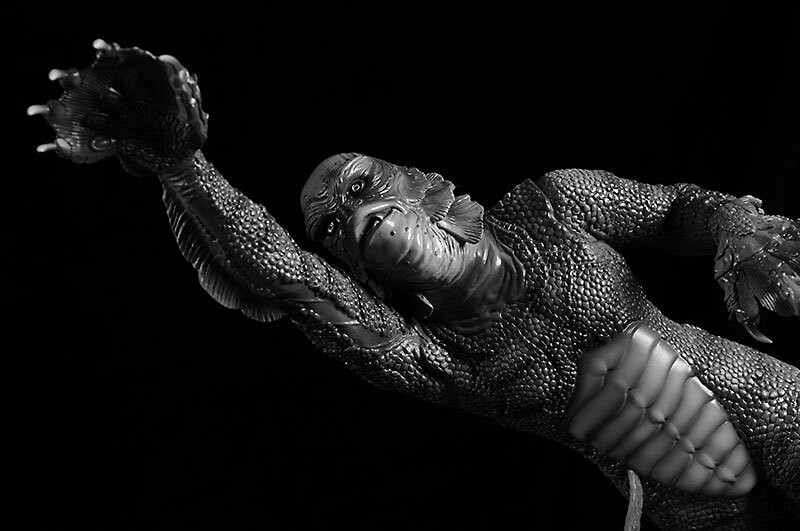 The Creature from the Black Lagoon is the best quarter scale figure to date that Sideshow Collectibles has ever designed. For those of you guilty of scrolling down to see what my overall score is going to be for the creature, there is no need to do so. Read on and you will understand why the CREATURE FROM THE BLACK LAGOON is more than a 4 star figure. 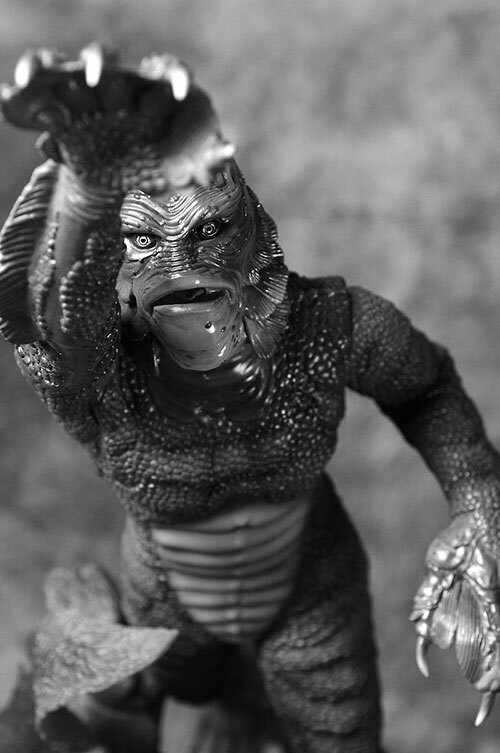 MWC: Like Steve, I grew up lovin' the Gill-man. I'm not quite as much of an old fart as he, having been born in 1961, but the Creature was a regular on Saturday afternoon monster movie shows. Let's be honest, the movie ain't all that great. But the creature design is one of the top 5 of all time, and was outstanding for the period. Let's see how Sideshow did with the PF! Steve: To quote the old cliché, “a picture is worth a thousand words” could not be closer to the truth. Even if Sideshow Collectibles decided to emboss its packaging in 3D they could not have done a better job. All four sides of the box have different views of the Gill-Man. The artwork on the box itself is so good; I couldn’t tell the difference between the front and back. Each side emulates a movie poster seen on billboards in the 50’s. This was the first time I had the urge to cut each section of the box and frame the different poses of the creature. Sideshow could have taken the easy way out and photographed one view of this quarter scale figure, and left it at that. 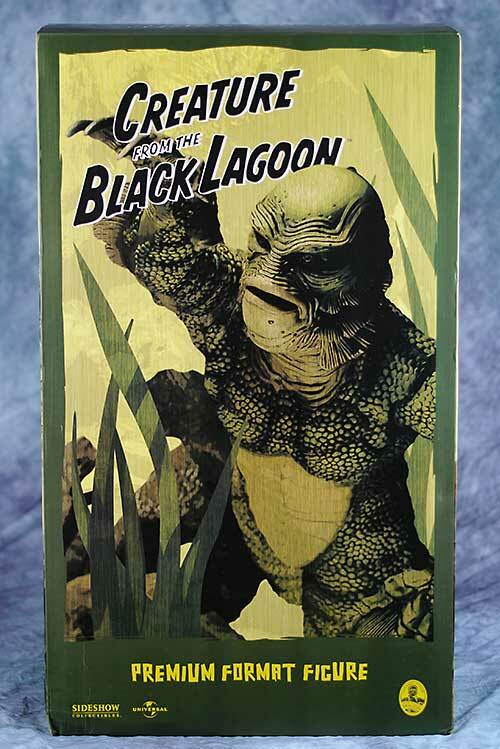 Instead, the artists decided to divide each section of the packaging with close-ups, under water scenes, large facial expressions of the creature, and even a realistic logo from the 1954 movie release. Don’t get me wrong. I am not about to cut the box up. In fact, if I didn’t know the figure was in the box, I would probably put the box on display. That’s how crazy I am. The artisans that designed the packaging deserve a standing ovation, not only for its green theme, but also how they were able to design the illusion of texture. There is no need to say much about how the figure itself fits tightly in the box. Sideshow wrote the book on that. MWC: As Steve mentions, the package goes a bit art deco this time around, artsing up the photos to make them appear more in style with the 1950's. It works well, and gives the package a litte more visual appeal than usual. I did end up with a fin broke on my little fish right in the package though, and keeping the PF save has to remain job 1. Steve: Sideshow had to hire an engineer to figure this one out. I wish I was able to spend ten minutes in the mind of the main artist that sculpted the creature and decided on an underwater setting for the entire sculpture. I am sitting at my computer trying to describe every detail while looking at the creature in all its underwater glory. I can’t. There are no words in any language that can describe the magnificence of this work of art. There are so many different green tones, glossy effects in the right areas, authentic fins, its mouth, ever so slightly opened, its lips with a tint of shine, the eyes ever so piercing, the gloss surrounding the creature’s lower chin and stomach areas that flow downward, the base filled with the most beautiful plants one could ever imagine, and even the five inch fish that swirls around the reef giving Gillman’s base the most realistic ocean beauty one could only see by visiting an exotic island. The Creature is a poetic work of art, and should be respected as such. At this point I am at a loss for words, mainly because I just can’t take my eyes off the creature. Each claw has its own touch of uniqueness. Even the curvatures of the feet themselves seem to flow in a steady stream of water. Sideshow did not create a statue. Sideshow sculpted a masterpiece that one could very easily compare to a Vincent Van Gogh painting. The piece is just that glorious. 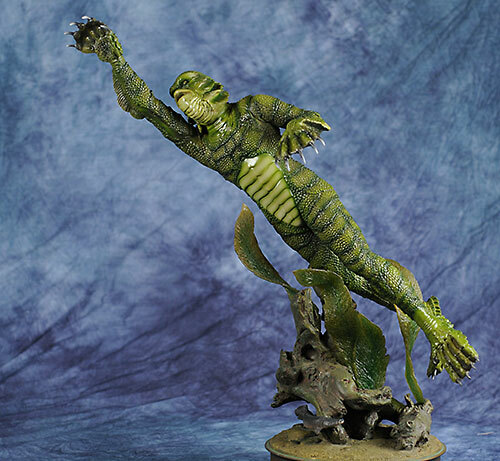 The majestic look of this statue makes the Creature from the Black Lagoon the best work Sideshow’s team of artists has ever sculpted. I feel a little guilty even owning this piece. The Creature is just that good. It makes me feel as if I am rich enough to afford a famous work of art from Sotheby’s, the most famous art gallery in the world, that sell sculptures rarely seen and owned only by a select few people in the world. MWC: I'm not quite as enamored as Steve, but I must admit that it is one of the nicest PF's that Sideshow has produced. 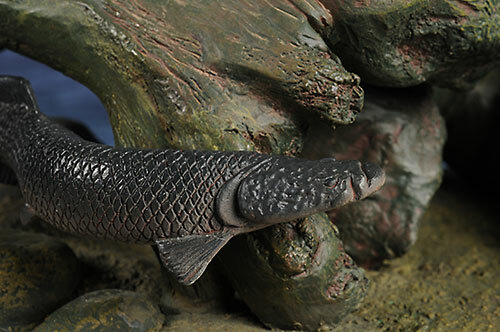 It is a beautiful sculpt, with excellent detailing on the skin and face. The base looks great, and even looks more fresh water in style than salt water. I suspect more folks will feel like Steve than me, but I think my biggest issue is that I would have preferred a walking, land based version. The water version allows for the cool base, but he's just not as dangerous looking to me when he's swimming. But as I said, I suspect most folks will love this design. The metal pegs that hold the creature, fish, and leaves in place look solid enough, and I'm hopeful that they'll not have any issues long term. The PF is a large one of course, with the creature himself almost 25 inches long from toenail to outreached claw. It's worth noting that there is an accuracy error here as well. The recently deceased Ben Chapman played the Creature on land, while Ricou Browning played him undersea. Mr Chapman was quite tall for the time at 6' 5", while Mr. Browning was much smaller. That meant that Chapman's costume had three sections across the front of the chest, while Browning's only had two. To be accurate, this version should have only had two, but it has the three like the land based costume. Steve: The paint opts are perfect from the tip of its right claw to the gold shimmer of the base. I don’t think the original costume, if photographed in color for the movie, could match the work that Sideshow was able to re-create; or should I say create for the fans to enjoy. MWC: I have to agree with Steve on this one - they did an excellent job with the paint work. I'm not scoring it quite as high, because there's something about the way the gloss was applied that doesn't quite work for me, but it's a fairly minor issue and the rest of the paint work looks just about perfect. In my opinion this piece does not need accessories. In fact, if Sideshow offered an exclusive, I’m not even sure what extra bonus accessory could be offered. I almost gave this category four stars because of the fish and the extra underwater decorative leaves that attach easily to the base. However, the Creature is so well done there is no need to add anything to it. If I wanted to be really really picky, I would have liked to see another fish swimming around and a few tiny underwater decorations. This is only an opinion. For me, the base is not an accessory. If you consider the base to be an accessory to this piece then add another half a star making this category a four star rating. MWC: I'm including the base and it's pieces in the Sculpt section rather than here. Steve: My definition of fun is being able to enjoy looking and touching a fine work of art. Without a stretch I could easily see my students using this piece as an educational tool, not only in an art class, but a writing seminar describing its every detail if given an assignment related to descriptive writing. I also feel my special education students would get great enjoyment seeing Sideshow’s Creature in person and writing about it. For me the Creature from the Black Lagoon is just plain fun to look at. MWC: Well, I'll stick with the idea that you have to play with it to really have fun, but I'm not holding that against the statue in my final score. I didn't expect to give him a score here, so it's not a negative. Steve: If I did not know any better and was at a fine art gallery it would not surprise me if the ticket price for this piece was in the four figure price range. MWC: The PF is actually priced about right. It's a limited edition of 1500, and it's unlikely that the ebay price will drop much below retail. Steve: I mentioned this earlier; however, it is worth repeating. I own most of Sideshow’s quarter scale pieces. 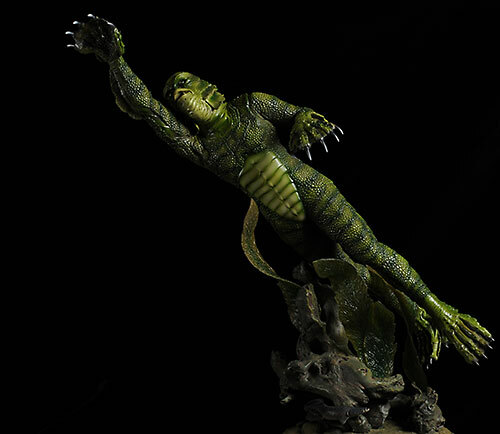 The Creature from the Black Lagoon is the best work Sideshow’s team of artists has ever created. As of this writing there are several places you can purchase the Creature. Many of Michael’s sponsors have them in stock. You might even pay a little less than the $350.00 price tag. At first the readers of my review might think the price tag is a little high, however, in my opinion, once other companies sell out, this will join the ranks of Iron man that has sold for over $1,500.00. Keep in mind that Sideshow only manufactured fifteen hundred pieces world-wide. I would run…not walk to lay my hands on this quarter scale figure. MWC: I'm not quite as thrilled with the PF as Steve, although I have to agree that giving it the coveted four stars wasn't too hard to do. It's a beautiful statue, and I'm very happy to add it to the collection. I'm a little disappointed that the design wasn't quite what I had envisioned all these years, but I'm getting over it. Now if QMX would finally do the full sized prop replica, I'd be ecstatic. - CornerStoreComics has him at $315. - Alter Ego Comics has him in stock for $325. - Things From Another World has them in stock for $382.50. - or you can search ebay using MyAuctionLinks.com. For the Australian readers, check out Shopping.com, a member of the Ebay family. TRIVIA ABOUT THE MOVIE - The physical appearance of the Creature was modeled after a likeness of the Oscar, the figurine awarded annually by the Academy of Motion Picture Arts and Sciences. 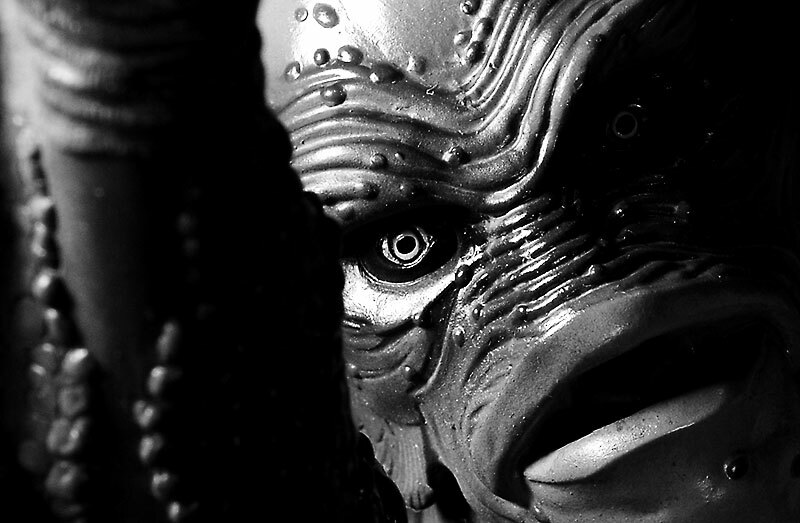 - Sideshow has done a great 12" version, and one from the later film, The Creature Walks Among Us. - the most recent smaller figure was from Toy Island. 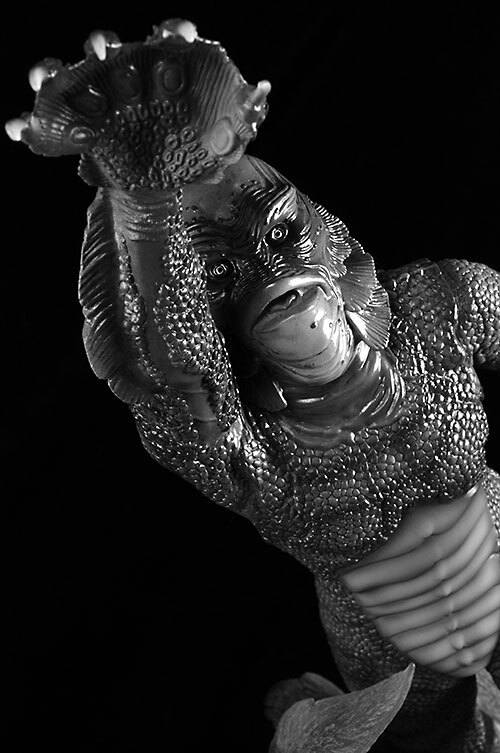 - and this mini-bust might not be an official Creature, but it's mighty close.